At Royal College of Healthcare we are committed to delivering training of an exceptionally high standard to all students. We have a range of services and policies to ensure that our students receive the best training experience possible. Our Student Handbook is a comprehensive guide to your training at Royal College of Healthcare. 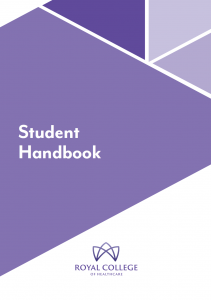 The handbook covers all the information you need about student support services, assessment, fees and more. The Unique Student Identifier (USI) is a number which will contain all of a student’s qualifications and results achieved through nationally recognised training from 1 January 2015. Students will have access to their USI account from 2016. How do I apply for a USI? You can either apply directly on the USI website, usi.gov.au and select the ‘Create a USI link’ or you can provide Royal College permission to apply for this on your behalf during your application process. Royal College of Healthcare is an equal opportunity education provider and is committed to ensuring the process of recruiting students is non-discriminatory and to provide training services which are accessible to all eligible individuals and meet the diverse needs of our students, irrespective of their age, gender, disability, country of birth, language, race, religion, culture or other background.